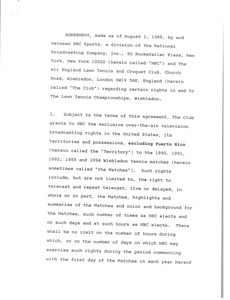 11 results found for: genres:"Contracts"
Draft of a contract between the All England Club and NBC Sports for television rights to the Wimbledon Championships. 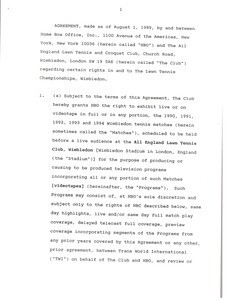 Contract draft for the agreement between the All England Club and Home Box Office for television rights to Wimbledon. 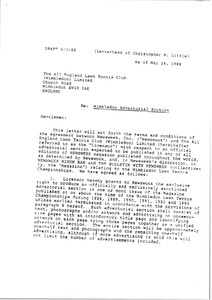 McCormack sends a draft of the contract with Melanie Taylor Kent for a limited edition serigraph depicting the Wimbledon Championships. 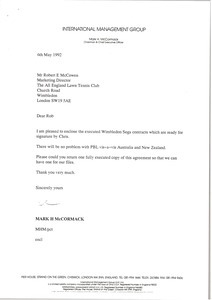 McCormack sends the Wimbledon Asahi contract and correspondence on the subject. 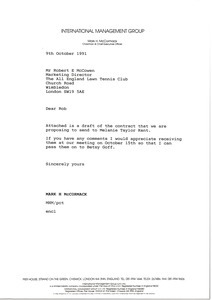 McCormack sends the Wimbledon Sega contract. 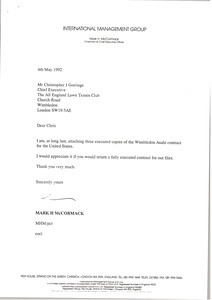 McCormack sends the renewal contract with Rolex and the All England Club regarding the installation and maintenance of scoreboards and clocks at Wimbledon. 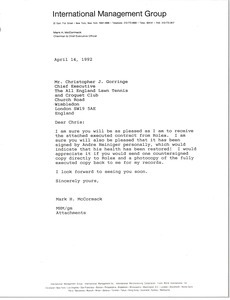 McCormack sends an executed contract from Rolex for the installation and maintenance of the scoreboards and clocks for the Wimbledon Championships. 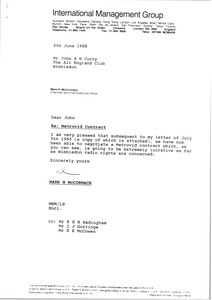 Sending along the Metrovid contract which will be lucrative as far as Wimbledon radio rights are concerned. 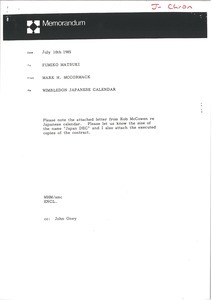 Discussing the Wimbledon Japanese calendar. 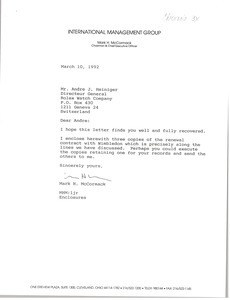 Includes series of letter on this topic and the executed copies of the contract.